A lot of trash and yard waste had piled up over the winter in our neighborhood. 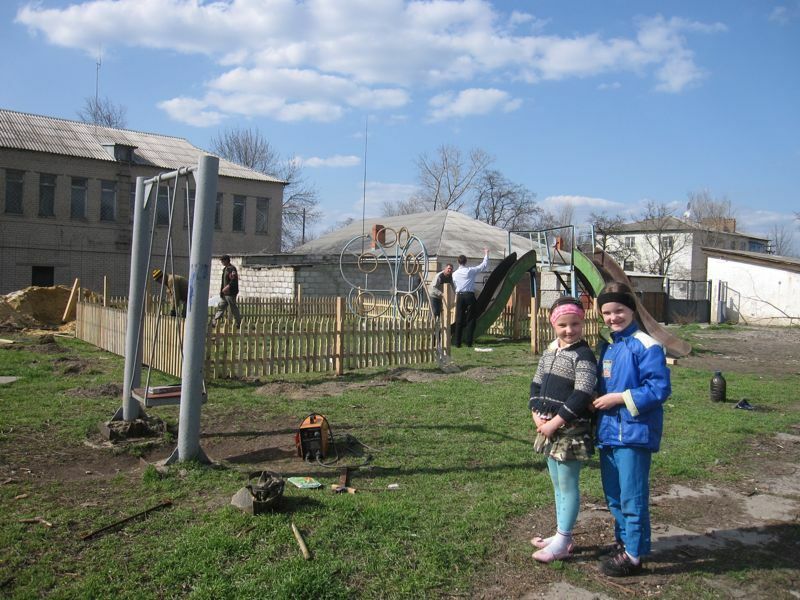 Luba and Vika, who live nearby, come to check out the playground's progress. Neighborhood volunteers do a fabulous job painting. 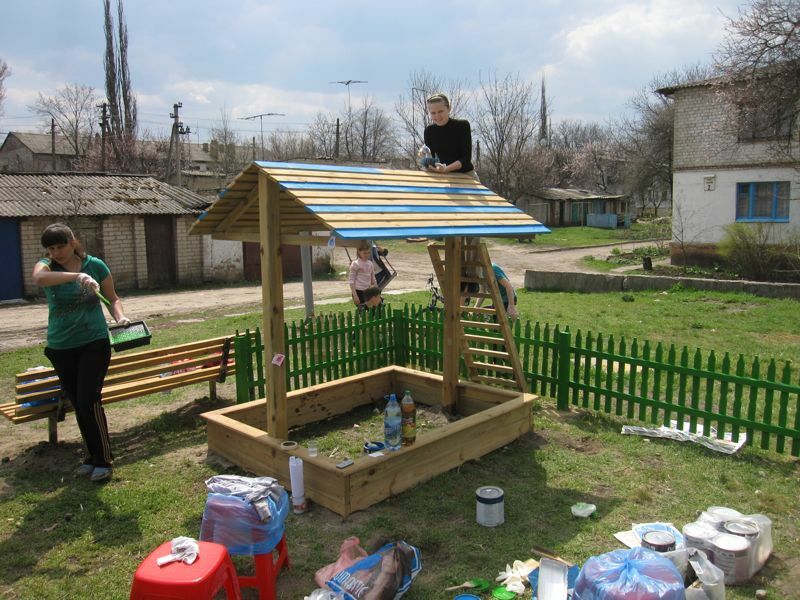 Olya finally got a chance to really paint in color—here she works on the sandbox roof. There was much excitement in the air when the workers came back to finish off the roof and swing! An incredible transformation can be seen on the playground's opening day! It was really fun to watch the transformation at the first playground, since we can actually see this one from our apartment windows! The first step for this site was to clean up the area, which was no easy task. 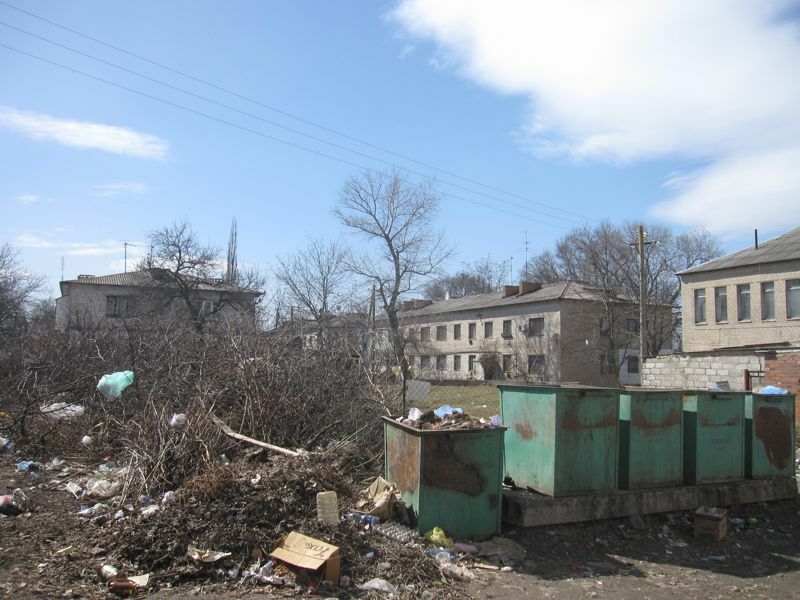 The neighborhood dumpsters were located about 10 meters from the site, and although the dumpsters themselves were regularly emptied, a huge buildup of trash formed around them throughout the winter. Additionally, people nearby decided to put their yard waste there last fall, which turned into a giant pile of branches and leaves. Alex and I were a little skeptical that the area could actually be cleaned up, but everything turned out great. First, the town council arranged for the branches to be hauled away. Then, they had the dumpsters moved around the corner, near an abandoned building. Finally, the last bits of trash and yard waste were cleaned up. We immediately noticed an increase in the number of kids playing on the old, worn out equipment. There were a couple of teetering, rusty slides (which were later removed), a swing, and a butterfly-shaped jungle gym. What a difference a little clean-up can make! So, the site was clean and dry! Our carpenters first installed the perimeter picket fence, then the bench, trash can, sandbox, and play structure. Once the basics were all ready to go, we held a neighborhood work day to paint. Alex and I printed up flyers and put them on all the apartment building doors in the neighborhood – about 12 buildings and 20 doors in all. We weren’t sure what kind of turnout we would get, and were pleasantly surprised when at least 20 folks came out to paint. Most of them were young parents, plus our partners Tanya and the mayor (also a neighborhood resident), a few school students, and even a babushka or two. We finished the majority of the painting that day, although Alex and I had to go back a few additional days to finish off some of the detail work. For reasons unknown to us, the playground sat mostly-finished for about a month. Finally, the carpenters finished off the details on the play structure (steps, climbing wall, slide, and swing), town workers moved the sand into the sandbox and play structure, and we painted the last little bits. The town hauled away the old, rusty slides, and we were good to go! Last Thursday, we held the official opening ceremony for the playground, even though kids had already been playing in and around it for a month or more! The mayor, Alex, and I gave some short speeches, some kids from the nearby preschool recited some poems and gave us flowers, and a little boy cut the red ribbon hanging across the gate! The kids in attendance rushed into the playground and began swinging, sliding, climbing, and playing in the sand. We passed out some drinks and cookies and took some pictures. Overall, a very successful opening! Everyday, we look outside and see all kinds of people—small children with their parents, babushkas, teenagers, school kids, random passers-by—playing and sitting and enjoying the space that was previously filled with trash and completely unused. Thanks again to everyone who helped make this project a success! View photos of the entire project! Playground #1 is almost finished! Sorry to have kept you all in the dark for a couple of weeks, but the exciting news is that our first playground (of 3) is amost ready! However, you’re going to have to wait a few more days for pictures, because we want you to be completely surprised by the finished product and site’s transformation! Our little neighbor keeps Jenya the carpenter company on the first day of work installing the first playground. After 2+ weeks of rainy days, our carpenters were finally able to start installing our playground equipment this week. The whole thing should be finished tomorrow! 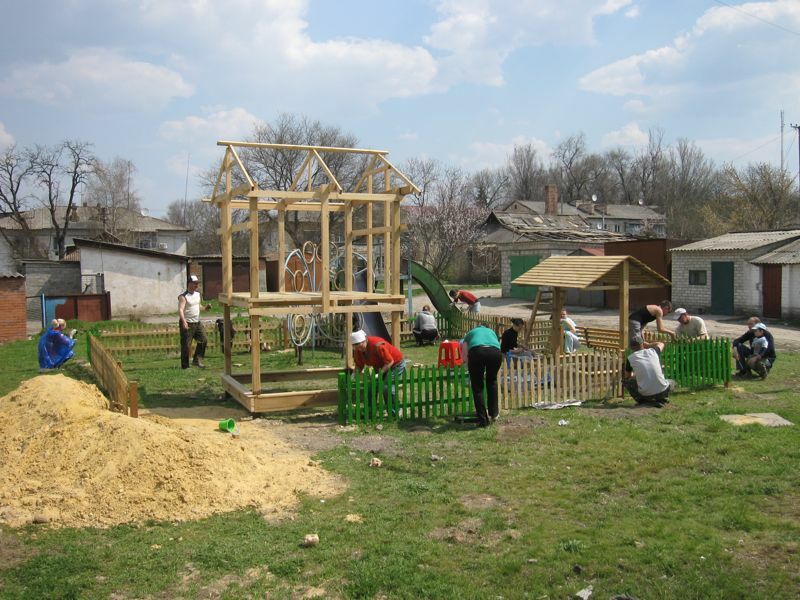 On Sunday, everyone will celebrate Easter, and then we’ll have a community workday on Monday to paint it all. Hopefully people will come out and help, since it’ll be a day off. We can actually see this site from our apartment windows, and it’s been fun to watch our neighbors—adults, kids, parents with small children—already walking by to examine the site and even try out the new equipment. I think it’s going to be a really popular spot! 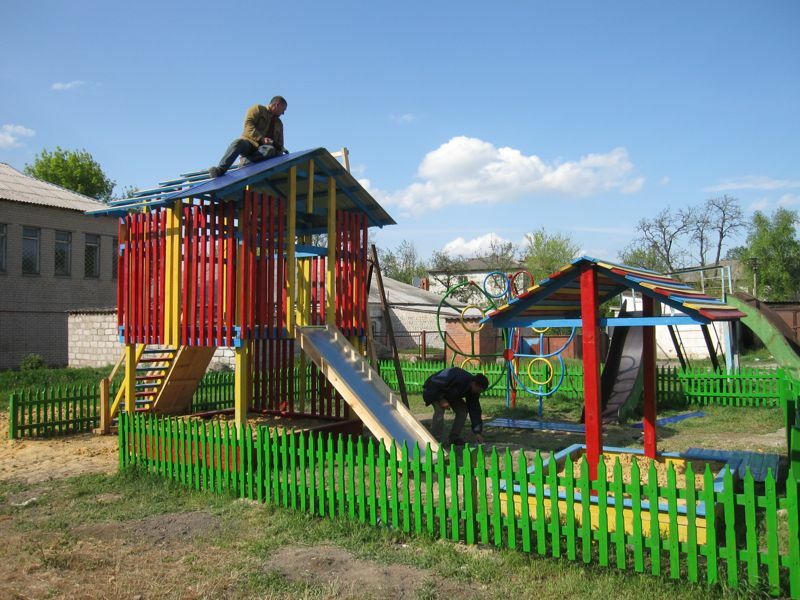 Finally: a side note about another noteworthy project in Ukraine. 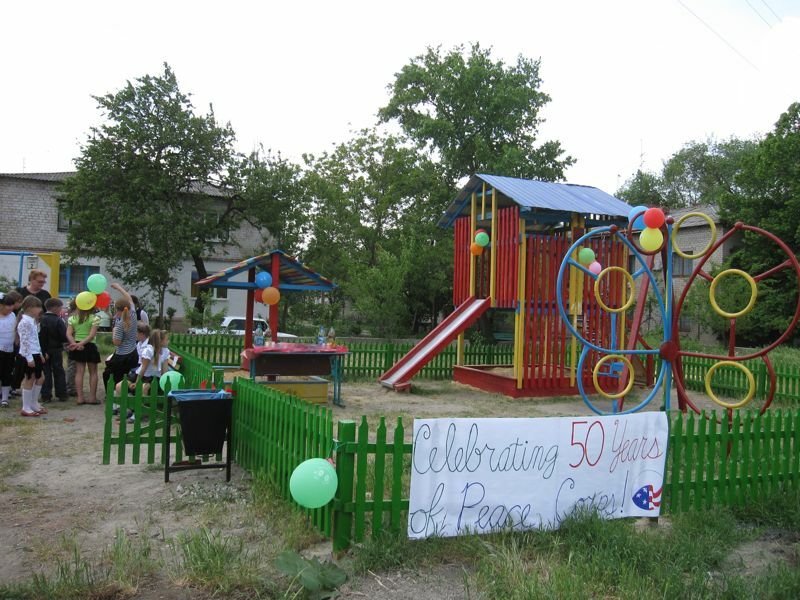 Peace Corps’ Gender and Development Council, of which I am a member, runs three annual summer camps for Ukrainian girls and boys. These camps offer wonderful opportunities for Ukrainian kids to discuss important issues such as gender, violence, HIV/AIDS, and human trafficking, all while having a great time at camp! It only takes $72 to send a child to camp for a week. So, if you missed the chance to help us with our Parks & Playgrounds Project, or if you want to do contribute to another fabulous project, donate here. To find out more information about the camps, please visit this website.